Pranayam is a Sanskrit word that means to enhance the life force energy that is present in all of us. When our breath is shallow or short, we are distanced from the life force in our body and may begin to feel depleted of energy. This often shows up as feelings of depression, anxiety, and/or exhaustion. Shallow chest breathing can create tension in the body and activate the body's stress response. In contrast, deep diaphragmatic breathing reduces stress and increases oxygen levels in the brain. Pranayama, or breathing exercises, can help bolster our energy and contribute to feelings of relaxation and well-being. Aromatherapy brings attention to the breath, and, used in concert with pranayama, can be a valuable tool for stress relief and life enhancement. Here a few simple pranayams for you to try. Incorporate aromatherapy by misting the air around you or spraying a tissue with a blend and tucking it into your pocket before you begin. Sit in a comfortable position with your feet flat on the floor and your hands resting in your lap. Inhale deeply through your nose, slowly counting from one to four as you do. Allow your belly rise as you breathe in. Pause for a moment, feeling your lungs fill with breath. Exhale slowly through your nose, counting from four to one as you do. Pull your belly towards your spine as you breathe out. Repeat for 1 - 5 minutes. Begin with your hands resting in your lap. As you inhale, gently lift your arms in front of you as if you are moving through water. Feel your rib cage lift slightly. Pause for a moment to feel your torso fill with breath. As you exhale, allow your arms to softly float back down to your lap. Feel your shoulders relax. 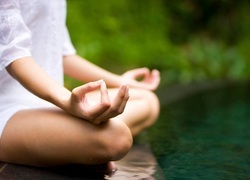 Repeat until you feel finished, then return to Calming Breath for a few breaths. As you inhale, reach your arms out to the side and up overhead. Feel your rib cage expand and the muscles on your side body stretch. Pause for a moment to feel your lungs fill with breath. As you exhale, allow your arms to float out and down, returning your hands to your lap. Feel your ribs return to their resting position.